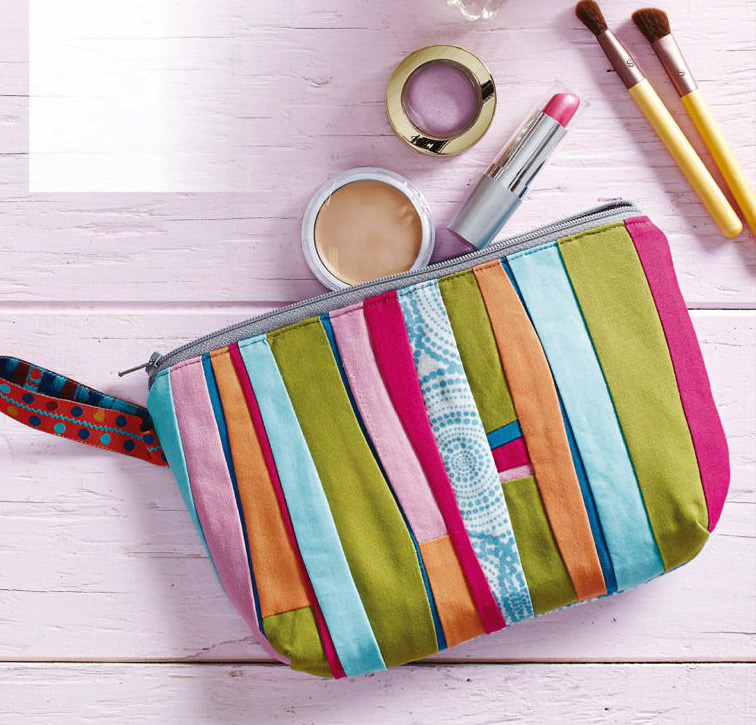 Zippered Bag Patchwork. Sewing Tutorial ~ DIY Tutorial Ideas! 1. 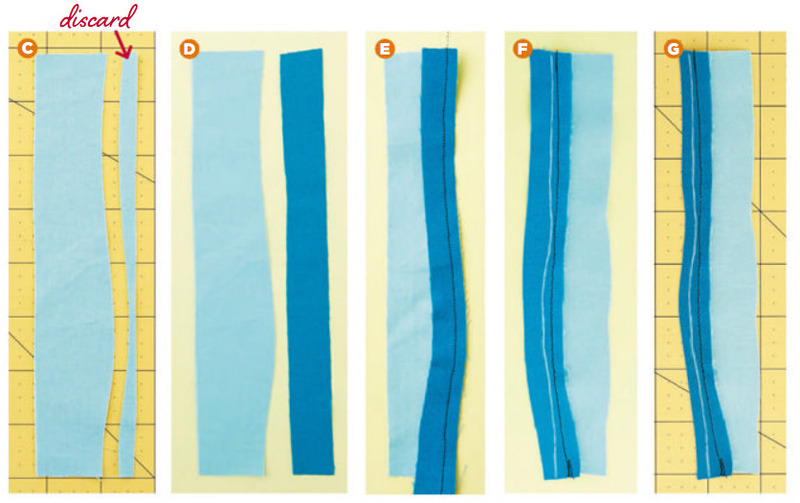 Begin sewing together your assorted strips using the freehand curved piecing technique. When you are ready to insert a skinny strip, place the strip to which you want to add an insert faceup on a cutting surface. Rotary-cut a gentle curve the length of the strip (Photo C). Discard the excess fabric on the right. 2. From a color that is brighter or darker than the just-trimmed strip, cut a 3/4"-wide strip for the insert. Even though this is a straight cut, the skinny insert will have enough flexibility to curve along the first strip because it’s only 3/4" wide (Photo D). 3. Place the second (insert) strip on top of the first strip with right sides together and the first inch or so of the cut edges aligned. Using a 1/4" seam, stitch the strips together, stopping as needed to reposition the second strip to line up with the first strip (Photo E). Press open, pressing seam toward the wider strip. 4. Place your strips wrong side up. With a chalk pencil or light lead pencil, sketch the next seam line on the insert strip, using the seam just sewn as a guide and making sure the space between that seam and chalk line is less than 1/4" (Photo F). If you want the insert color to disappear at one or more points, sketch right beside the sewn line. Trim excess fabric 1/4" from the chalk line (Photo G). 5. 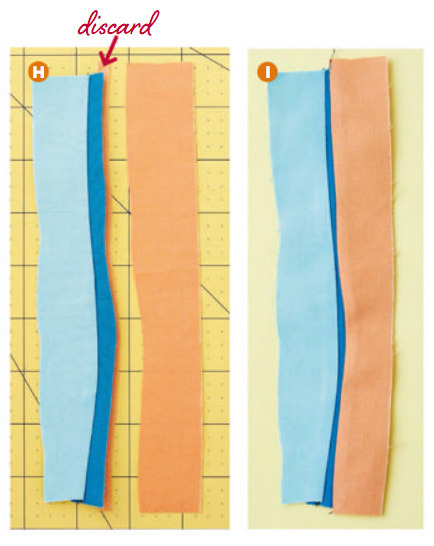 Place the pieced fabric and the next strip you’re going to add faceup on your cutting surface. Lap the cut edge of the insert strip over the next strip and use it as a guide for cutting a gentle curve the length of the strip (Photo H). Discard the excess bit of fabric under the insert strip. 6. Flip the next strip back onto the insert; stitch on the marked chalk line on the insert. Press seam toward the wider strip (Photo I). 7. 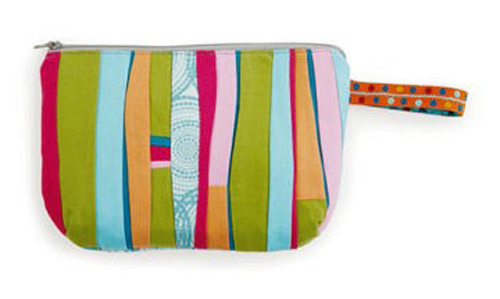 Continue adding strips, varying the strip width, to piece a rectangle that is at least 6 1/2x9 1/2". Какая классная, мне очень понравилась! И спасибо ха фото процесса!